Database architecture is logically divided into two types. Two-tier Client / Server architecture is used for User Interface program and Application Programs that runs on client side. 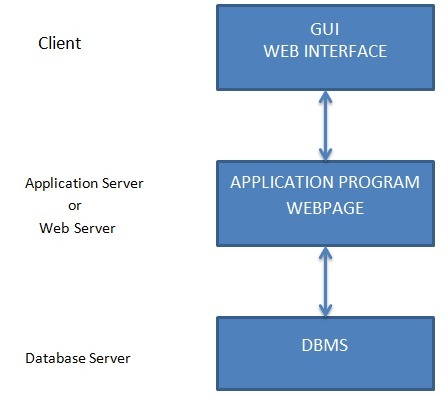 An interface called ODBC(Open Database Connectivity) provides an API that allow client side program to call the dbms. Most DBMS vendors provide ODBC drivers. A client program may connect to several DBMS's. In this architecture some variation of client is also possible for example in some DBMS's more functionality is transferred to the client including data dictionary, optimization etc. Such clients are called Data server. 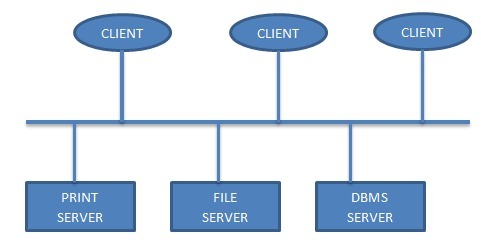 Three-tier Client / Server database architecture is commonly used architecture for web applications. Intermediate layer called Application server or Web Server stores the web connectivty software and the business logic(constraints) part of application used to access the right amount of data from the database server. This layer acts like medium for sending partially processed data between the database server and the client.